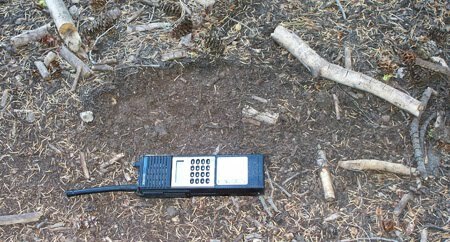 Back in August of 2007, I had the opportunity to interview a forest service botonist who saw a sasquatch just a few days before. He was walking off trail behind a closed ski resort on his way up to an isolated meadow when he noticed a tall, thin creature peering at him from behind a stump. Bryan Meadows (lower right) when he spotted the creature. Previous to this sighting, the ski resort staff was complaining of a troublesome bear raiding the garbage cans at night. Another note of interest would be the observation by the witness that the nearby stream was thick with brook trout. He noted that in his 26 years of working as a forest service botonist, he had never seen so many of the fish in any stream. We went on to say that they were so thick you could walk on them, which is obviously an exaggeration, but that's how we humans speak. A large impression was found nearby where the creature ran uphill to escape the area. It isn't clear exactly how long it is, but by browsing around the internet, I have found that the radio is likely to be between 14 and 15 inches long, including the antennae. Scuff mark in the path of the escaping creature. Another notable thing about this sighting is the nearby food source. Not only was the sasquatch possibly raiding the garbage cans at the closed-for-the-season ski resort, but there was a superfluous supply of easily catchable fish in the small stream flowing nearby. The witness told me that since the fish were so small, anglers probably wouldn't bother with them. Besides, this was private land on a closed ski resort, and no anglers were likely to be there. 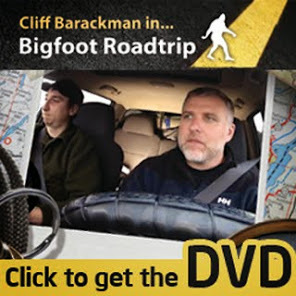 I have found again and again that sasquatches can be found in areas with a readily available protein supply. Food, cover, and water are the three most important items to any animal, and sasquatches are no exception. Today, August 23, 2007, I was hiking off-trail in El Dorado County, California in the forest 60 feet north of the Bryan Meadow trail, when at about 10:30 a.m. I saw a tall dark figure peering around a large red fir stump. This was from perhaps 100 feet away, I quickly walked up to the stump, but there was no one there. It would have been possible to move uphill away from me using the large stump as cover, but only a very athletic person could have managed this in the time available. Moving then uphill and to the SE, I regained the Bryan Meadow trail and there noted a large footprint, which I photographed next to my two-way radio. It is about twice the length of my foot, (a size 12 boot size). I do not know the source of this print, but it was where the rapid retreat occurred. I had just parked at the Sierra Ski area (Short Stuff run), and begun walking up the forest north of the trail to Bryan Meadows. I was moving quietly and slowly, crossing from the north side of the stream to the south without being on any trail. Another biologist was still moving up the canyon on the north side of the stream, but was well ahead of my position. It could have been a human, but the person would have to have been wearing all uniformly dark clothing and had a dark complexion or been wearing dark paint. Head to knee, the figure was a uniformly dark hue and no other detail was discernable, except that the shoulders were slightly more narrow than the average person would be, and the height was at least 6'-3" to 6'-5". The figure was peering at me from the west end of the stump, leaning forward, so that all above the knee was visible. The figure was of a uniformly dark color, perhaps black. For the full report from back in the day, you can click this link.